"An utterly delightful debut novel from cookbook author and TV cooking-show producer O’Reilly. When Angelina’s husband suddenly dies of a heart attack, she is devastated. When she loses her job a few days later, she’s in real trouble. To escape her worries, she dives into the thing that has always brought her comfort—cooking. As a young woman, she had planned on culinary school, but her mother’s, and then father’s, terminal illnesses rerouted her dreams. Still, she’s a world-class amateur and treats her close-knit South Philly neighborhood to the results of her recent grief. One fan is Basil Cupertino, neighbor Dottie’s retired brother, who’s recently moved in. Basil—escaping his sister’s almost deadly cooking—makes Angelina a proposition: He will pay her handsomely for breakfast and dinner six days a week. Trying to hold poverty and depression at bay, Angelina agrees. Word spreads through the neighborhood, and soon Basil and Dottie’s handsome nephew Guy (escaping the seminary) joins in, as does young Johnny from across the street, the discerning Mr. Pettibone, the elderly Don Eddie and his driver Big Phil, and Jerry, who’s known Angelina forever. Her bachelors are treated to exquisite fare, and also company—the motley crew make a companionable dinner club in Angelina’s home. One night, feeling tired and faint, Angelina gets bittersweet news: After years of trying, she is four months pregnant. The thought of raising a child alone is terrifying, but the bachelors help out, and soon Angelina’s grief is replaced with the somber joy that her husband will live on. 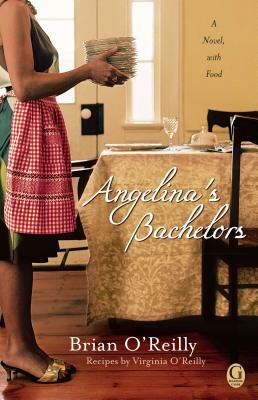 There are some mishaps along the way, including the city trying to shut her down, but Angelina triumphs when her long-lost dream of owning a restaurant becomes a reality. Filled with more than 20 (fairly complicated) recipes for Angelina’s gourmet fare, the food is only half of the novel’s winning ingredient—O’Reilly’s keen ear for the neighborhood swells lends a charming, timeless quality to the tale.